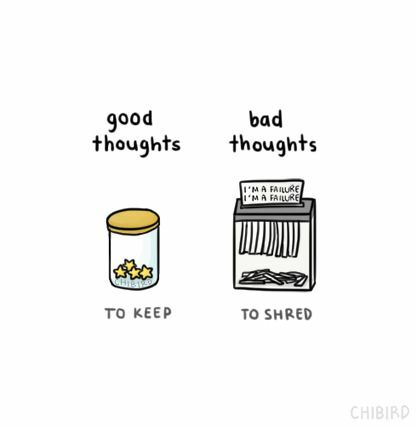 Two Step: Breaking Our Addiction to Negative Thinking. You know...all surrounded in light and smiling and content and shiz. In a flowy tunic top. Hee hee, haa haa, snort....I'll probably never seem all surrounded by light and shiz BUT I can set a fierce intention to focus on positive rather than negative thinking all while remembering that we're probably OK right now. This practice will for sure help me to put more good energy out than bad which is one of my ongoing goals at this time. The problem's not the problem, it's your thoughts about the problem. Sally forth, dear friends! Remember, you are not responsible for the first thought that pops into your head but you are responsible for whether or not you continue to dwell on it.